Having made my own jump rings from silverplated copper wire, I decided to put them together into something that looks a bit more like some jewelery. 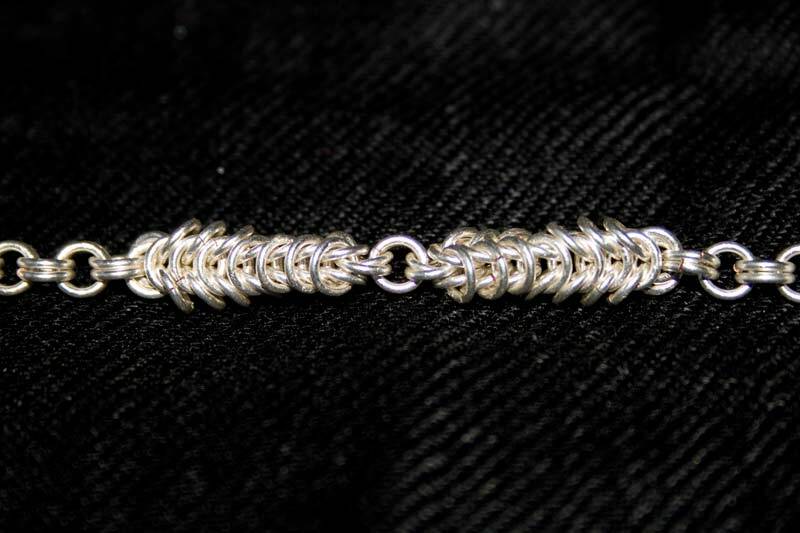 The result, a 7" bracelet with a chain made of double links and a box-chain central section. The joins in the links are much tighter this time round than my last attempt. Things to work on for the next one are to scratch the links less with the pliers while closing them, and to make the chain of silver rather than plated copper. I'm quite pleased with the decorative section in the middle though - really tight due to the aspect ratio of the rings. Daws: Looking good! You're right about the silver plated copper, it's good for practising or working out new ideas but you can't beat silver. Plain copper could be nice, I've been thinking about making some copper maille bracelets. Copper also has supposed healing/curative/therapeutic/ability to ward of time-travelling demons* benefits. *maybe I made the last one up .-= Daws´s last blog ..Myspace =-. Karen: Hi there, I was impressed with the ring making. Did you persevere? I'm also addicted to chainmaill and am in the process of trying to figure out so many weaves! lesault: Hi Karen, I haven't made anything else since the chain above - been far too busy with work, but I'm hoping to get back into it this summer. What are you working on at the moment?